Search for the best flight prices from Manchester to Milan. Compare prices, book today and save money with Manchester Airport. Milan is a city steeped in pleasure, where shopping isn’t just a lifestyle but practically a religion. The place offers doses of life and style in equal measure, with a throbbing club scene and delicious restaurants all mixed up with the biggest names in Italian fashion and design. As Italy’s fashion capital and regular trade fair host, Milan has a mind-boggling choice of accommodation. There’s a surfeit of five-star luxury, such as the futuristic Boscolo Exedra Milano (Corso Matteotti 4-6), overlooking the Duomo (cathedral), and more traditionally styled choices such as the lavish Park Hyatt Milano (Via Tommaso Grossi 1) in the fashion district. There are plenty of small hotels, B&Bs and guesthouses too. Hotel Fenice (Corso Buenos Aires 2) has simple rooms with parquet floors and high ceilings and is close to the metro. Hotel Cervo (Piazzale Principessa Clotilde 10) is old-fashioned and simple, and close to the train station. 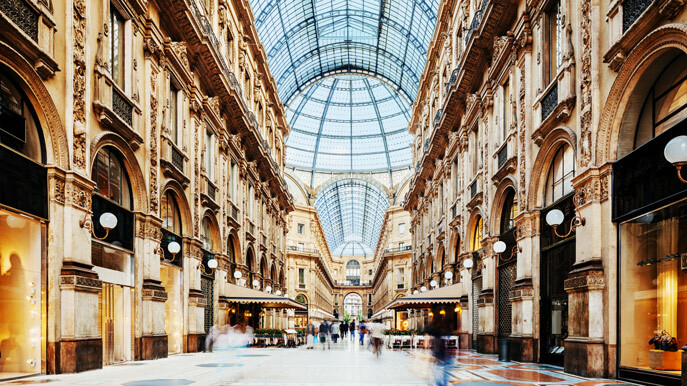 Milan is designer shopping heaven, with a vast array of glittering boutiques and homewares shops. Most of the city’s designer stores glitter and beguile in the convenient central area known as the Quadrilatero d'Oro ('rectangle of gold'). Another iconic shopping spot is the Galleria Vittorio Emanuele II, the glass-roofed arcade that’s one of the oldest shopping malls in the world; Prada has been in business here since 1913. However, to shop as the locals do, head to the city’s many outlets. Some of the best include Salvagente Milano (Via F.lli Bronzetti 16), and 10 Corso Como (Corso Como 10). Milan is Italy’s most sophisticated city, so of course you can eat fantastically well. One of Milan’s most famous eateries is deli-restaurant Peck (Via Spadari 9), a vast temple of gastronomy that includes a dining room and wine bar. Upmarket places cluster around the Duomo, but there are plenty of mid-range options too, such as Osteria delle Vigne (Ripa di Porta Ticinese 61) in the canal district. A particularly Milanese fashion is the penchant for aperitivi, whereby you can graze on an unlimited buffet of snacks to accompany an early evening drink (from around 6-9pm), for a small extra charge. Carnival is celebrated for four days longer in Milan than anywhere else. Children wear colourful costumes and throw coriandoli (coloured paper confetti), and there is an enormous procession that culminates at Milan’s Duomo. Spotlight fashion shines on Milan as nearly 100 designers unveil what’s hot and what’s not at invitation-only shows, while parties and receptions mark the occasion all over the city. Traffic is barred from the centre as local and international athletes run either the Stramilano route (15km) or a half-marathon through the centre of Milan. Concerts, arts and crafts stalls, street performers, folklore events, theatre and more line the streets that surround the Navigli canal for the first half of June, and this festival culminates in a torchlight procession. Oh Bej! Oh Bej! means ‘Oh so nice! Oh so nice!’ in Milanese dialect, and this is a celebration of Milan’s patron saint, Sant’Ambrogio, with processions, celebrations and a Christmas market. It also heralds the opening of La Scala’s opera season.